This article is about Liz, a character from The Super Mario Bros. Super Show! who believes that she's the Queen of England. For the actual Queen of England, see List of implied people § Queen of England. 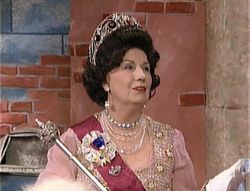 First appearance "No Way to Treat a Queenie"
Liz, who incorrectly prefers to be known as the Queen of England or Queenie, is an elderly, somewhat insane Brooklynite. She happens to either be pretending, or is seriously convinced that she is the Queen of England – she even goes as far as dressing like her. Her name being a short form of Elizabeth may play a part in this. She apparently lives at an asylum as a result of her behavior. She appears in the episode No Way to Treat a Queenie from The Super Mario Bros. Super Show!. When the Queen of England comes to New York City, Liz takes advantage of the opportunity to escape from her home, much against her doctor's orders. Liz wants to live like common folk, and eventually stumbles upon Mario Brothers Plumbing, where she is greeted by Mario and Luigi, who have no idea that she is not really the Queen. Liz explains that the reason "we" came to Mario Brothers Plumbing is because "we're" sick and tired of being treated like royalty. When Luigi asks Liz what she meant by "we", she mentions that she needs to use the royal wee, or rather, washroom. Liz then asks Mario and Luigi if they can treat her like common folk, to which they bow in response. Over the course of the day, Liz mops the floor, washes and irons Mario and Luigi's clothes, and replaces the shingles on the roof before preparing the only meal she knows how to cook for lunch, a fish 'n' chips pizza. Mario asks Liz to sit down, but she declines his offer, telling him to forget about it, as she feels that she has lived as a commoner long enough. Liz then arranges for a quick ceremony, and asks for Mario and Luigi to bow before her, so that she can dub them both as sirs. At that moment, Liz's doctor arrives at Mario Brothers Plumbing, and is relieved to have found her. The doctor subliminally convinces Mario and Luigi that Liz is actually a crazy woman, and thanks them, as he leads Liz back to her home, promising her tapioca pudding, her favorite, for dessert. After Liz's departure, Mario comments that while she may not have been a good queen, she did make a mean fish 'n' chips pizza, which he and Luigi proceed to eat. This page was last edited on September 20, 2018, at 20:32.